"I signed up to fight in the war. I went away a soldier, I came home an outlaw." Warner Bros has finally debuted the first official trailer for Live by Night, both written and directed by (and starring) Ben Affleck. The film is set in Boston in the Prohibition Era and centers around a group of individuals and their dealings in the world of organized crime. Affleck stars as Joe Coughlin, the youngest son of a Boston police captain, who becomes an outlaw. The full cast features Scott Eastwood, Elle Fanning, Zoe Saldana, Sienna Miller, Chris Sullivan, Anthony Michael Hall, Brendan Gleeson, Titus Welliver, Chris Messina, Chris Cooper and Derek Mears. This looks totally awesome. Lots of guns, booze, criminals, and some stunning cinematography to bring the sets to life. Looks like Affleck is getting better and better as a director. Boston, MA - 1926. The '20s are roaring. Liquor is flowing, bullets are flying, and one man sets out to make his mark on the world. Prohibition has given rise to an endless network of underground distilleries, speakeasies, gangsters, and corrupt cops. Joe Coughlin, the youngest son of a prominent Boston police captain, has long since turned his back on his strict and proper upbringing. Now having graduated from a childhood of petty theft to a career in the pay of the city's most fearsome mobsters, Joe enjoys the spoils, thrills, and notoriety of being an outlaw. But life on the dark side carries a heavy price. 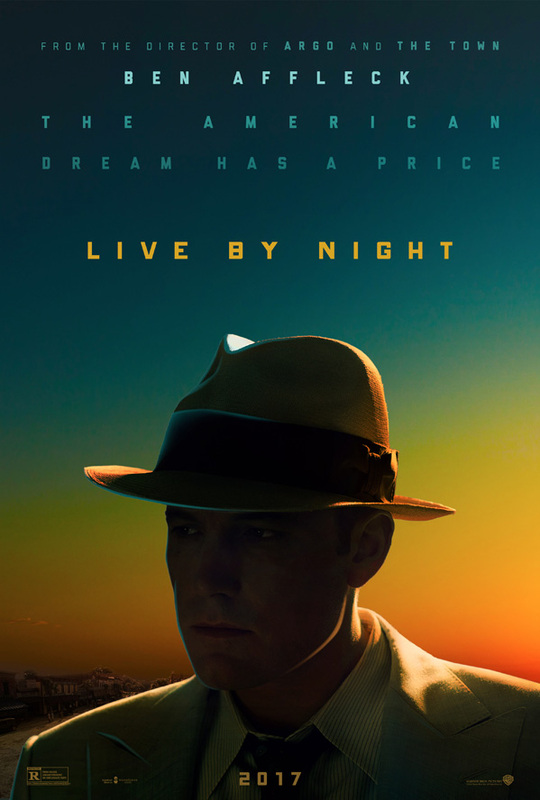 Live by Night is both written and directed by actor/filmmaker Ben Affleck, who directed the films Gone Baby Gone, The Town and Argo previously. Based on Dennis Lehane's novel of the same name. Warner Bros will open Live by Night in limited theaters in December, with a wide release on January 13th, 2017. First impression? I don't know if Ben will ever be better than a decent actor, but he keeps shutting up critics with every directorial effort. He's very impressive as a director, not something I would have ever guessed. I love the premise and the execution. I thought The Town was excellent so I'll definitely keep this on my radar. yeah but why oh why does he have to star in his own films? Its that same frowned expression he had in Argo and The town. Still. Will watch for sure. Probably easier because he knows what kind of performance he wants for the character. And ego. Yeah, I'm all over this. It's limited December, wide in January, meaning they're playing it like it's an indie film... But it's still a bit concerning. Two shots; the car moving through fireworks(? ), and the speedboat moving across the lake at dusk. Man this dude has a good eye. Can't wait to see this. Ben Affleck's time... How long will it last? It looks beautiful, the cinematography, the lighting, the clothes etc. but it sounds ... errr ... far fetched. Visually, it looks really good. This looks like classic noir with some color breathed into it! COOL! I'm down! I really begin to think we're gonna get the best Batman movie. I trust Affleck. Zoe's back to playing the white guys black woman. I pray she truly gets hers one day.